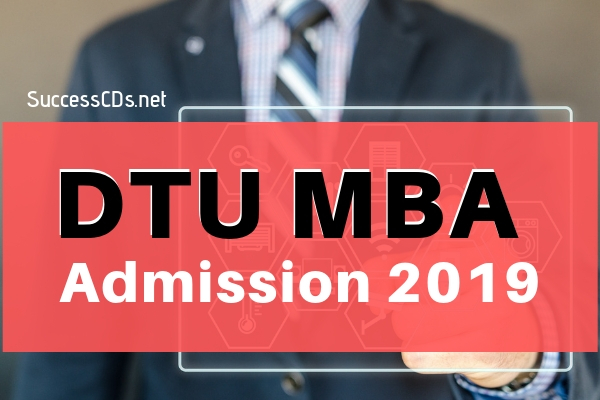 DTU MBA Admission 2019 - Delhi Technological University (DTU) and Netaji Subhas University of Technology (NSUT), invites online applications for common admission process of two-year full-time MBA Program for the academic year 2019-21 (batch) of the following Departments of Universities established by Govt. of NCT of Delhi. Interested and eligible candidates may apply as per schedule mention. Candidates can also check the details process of application, eligibility and other information on this page below. Our MBA graduates have dual specialization. Students get to choose two of these given specializations in 2nd year. The reservation of the seats for SC/ST /OBC and PWD are as per the Policy of the Government of N.C.T. of Delhi. One seat is reserved for Kashmiri Migrant. However, there will be no relaxation in the minimum eligibility criteria. A candidate who has passed any graduate examination with 60% marks in aggregate from a recognised university/institution is eligible to apply. However, a relaxation of 10% to SC/ST candidates shall be given in eligibility criteria. Those who are appearing in final semester examination may also apply, provided that they submit the proof of eligibility by a specific date declared by the university. The shortlisted candidates are required to appear for a Personal Interview and Group Discussion. Admission shall be made on the basis of combined merit based on CAT score, and performance in Group Discussion and Personal Interview. The candidate with higher CAT percentile shall be ranked higher.